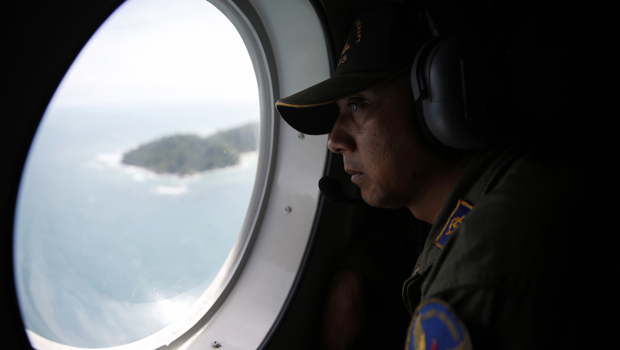 Indonesian officials leading the search and recovery effort into AirAsia Flight 8501 suspect that the pilots may have attempted a steep climb, CBS News correspondent Jeff Pegues reports. However, the officials are not willing to say so definitively until data from the plane's black boxes have been retrieved. Authorities also suspect the plane's airspeed was a problem as well but were not willing to commit to that suspicion officially, Pegues reports. The black boxes remain unaccounted for, but once recovered they should be able to provide detailed information about altitude, airspeed and engine performance as well as the pilot's final words. Bad weather hindered efforts to recover victims Wednesday and sent wreckage drifting far from the crash site, as grieving relatives "surrounded in darkness" gathered in an airport and prayed for the strength to move forward. The massive hunt for 162 people who vanished Sunday aboard the Airbus A320 from Surabaya, Indonesia to Singapore, was severely limited due to heavy rain, wind and thick clouds. Seven bodies, including a flight attendant still wearing her red AirAsia uniform, have been recovered, said Indonesia's Search and Rescue Agency chief Henry Bambang Soelistyo. Indonesian officials denied earlier reports that one victim was found wearing a life jacket in the Java Sea. So far, none of the bodies recovered have been wearing life jackets, suggesting catastrophe struck the flight with little or no warning. CBS News correspondent Allen Pizzey says there were also reports in the local media Wednesday morning quoting a co-pilot from one of the search and rescue planes who said he had spotted two or three bodies in the sea still holding hands. The weather prevented divers from retrieving bodies in the Java Sea on Wednesday, and helicopters were largely grounded, but ships were still scouring the area. Sonar images identified what appeared to be large parts of the plane, but strong currents were moving the wreckage. "It seems all the wreckage found has drifted more than 50 kilometers (31 miles) from yesterday's location," said Vice Air Marshal Sunarbowo Sandi, search and rescue coordinator in Pangkalan Bun on Borneo island, the closest town to the site. "We are expecting those bodies will end up on beaches." Simple wooden boxes containing some of the first bodies to be repatriated were unloaded Wednesday from a helicopter in Pangkalan Bun, central Indonesia, with flowers placed on top. The boxes had signs on their fronts, numbered 001 and 002. The remains were later flown to an operations center at a military airbase in Surabaya, East Java. Nearly all the passengers were Indonesian. The airliner's disappearance halfway through the two-hour flight triggered an international search for the aircraft involving dozens of planes, ships and helicopters from numerous countries. It is still unclear what brought the plane down. Recovering bodies was expected to remain difficult for the near future. Indonesia's meteorology and geophysics agency predicted that the conditions would worsen, with more intense rains, through Friday. The aircraft's cockpit voice and flight data recorders, or black boxes, must be recovered before officials can start determining what caused the crash. Items recovered so far include a life jacket, an emergency window, children's shoes, a blue suitcase and backpacks filled with food. Indonesia is predominantly Muslim, but most of those aboard were Christians of Chinese descent. Just one Surabaya church -- Mawar Sharon Church -- lost 41 members in the crash. On Wednesday, around 100 relatives gathered for a prayer service in a hall at the Surabaya airport where the Rev. Philip Mantofa urged the crowd to hold onto their faith, despite their pain. "Some things do not make sense to us, but God is bigger than all this," he said. "Our God is not evil ... help us God to move forward even though we are surrounded by darkness." Before breaking up, those gathered stood together and sang with their hands reaching upward: "I surrender all. I surrender all. I surrender all to God our savior. I surrender all." About 125 family members had planned to travel to Pangkalan Bun, 100 miles from the area where bodies were first spotted, to start identifying their loved ones. However, Surabaya airport general manager Trikora Hardjo later said the trip was canceled after authorities suggested they stay to avoid slowing down the operation. Instead, some relatives gave blood for DNA tests in Surabaya, where the bodies will be transported, and submitted photos of their loved ones along with identifying information, such as tattoos or birth marks that could help make the process easier. Pizzey reports that Indonesian President Joko Widodo flew into Surabaya on Tuesday to visit the grieving family members and lend them his support. Nearly all the passengers from Indonesia were frequent visitors to Singapore, particularly on holidays. It was 13-year-old Adrian Fernando's first trip to the city-state and was supposed to be a fun vacation with his aunt, uncle and cousin before he went back to school. "He is my only son," said mother Linca Gonimasela, 39, who could not join them because of work. "At first, he didn't want to go, but later on he was persuaded to join them for the New Year holiday."